Liz Moniz had solar panels installed in her home in January 2015. She’s able to track how much she’s saving and how much energy the panels produce. Photo by Seth Thomas. Click to Enlarge. Drivers will likely see more signs popping up around town instructing the viewer to look up. These arrows point toward solar panels installations, and there have been plenty of these projects in the works recently. Data on the Town’s solar permits reveal a steady trend over the past five years of homeowners opting for solar panels. In 2013, the number of permits issued for panels was 73. In 2014, that number climbed to 188. Last year, it jumped to 358. Dartmouth has seen a trend toward sustainability in recent times. An upcoming education center at Round the Bend Farm hopes to teach students about food systems. UMass Dartmouth’s executive chef is growing his own lettuce for students in the winter. The Lloyd Center for the Environment has plans to create the state’s second Living Building Challenge-certified structure. This story first appeared in Dartmouth Week on January 29th, 2016. It was written by Seth Thomas. These trends in Dartmouth match trends happening elsewhere in Massachusetts. According to state data, there were 67,348 residential panel installations in 2014. Last year, that number climbed to 130,338. 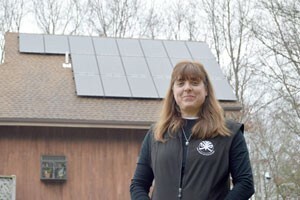 For Liz Moniz, a resident of North Dartmouth, solar panels were a no brainer for her and her spouse. She said that, as an employee of The Lloyd Center, she tries to find ways to be environmentally conscious. But the savings were a major selling point. “Our electric bill yesterday was negative-ninety-nine dollars,” she added. Her roof is at a steep pitch, meaning the recent snow storm that hit town rolled off her panels. She said her backyard sees plenty of sun throughout the morning. Solar panels work best on South-facing roofs. Moniz recommends that anyone interested in panels shop around first. She consulted with three companies before settling on a pay-to-own model through Real Goods Solar. While solar panels have a steep initial cost, the state has several options for customers to help lessen the burden of making the investment. Massachusetts is a state that allows solar panel owners to benefit from Solar Renewable Energy Credits, which enables a utility to take credit for the clean energy produced by the homeowner. These credits can help the homeowner get a return on investment from the panels. Net metering is another way that customers can save cash. Net metering essentially allows homeowners to run their meters backward. When a solar user produces more energy than needed for a household, the meter runs backward and the customer receives a credit. At the end of the month, if there is a net credit, that credit is applied to the utility bill, and it’s roughly equal to the retail rate of energy. Those credits carry over from month. Customers will likely generate more credits during the summer and use the credits in the winter when the system is producing less. As far as leasing is concerned, while it may save homeowners upfront, a study from the Massachusetts Department of Energy Resources found that buying to own leads to more savings over time than leasing. While all the options for homeowners may seem staggering, the information users can acquire about their new investment is straightforward. Homeowners can track how much energy the panels are producing and how much they are saving through an app or through computer software.